Would you like to develop strategies to help you improve your mental health? 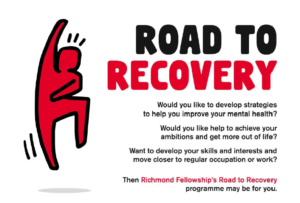 Then Richmond Fellowship’s Road to Recovery programme may be for you. This 12 session programme takes place one day a week (from 11:30am until 3pm) for 12 weeks. The next programme will start on Wednesday 20th February and run every Wednesday until 8th May.